If you live in the suburbs and have an important health issue in need of addressing, you’re going to seek out the region’s most seasoned medical professionals, at facilities equipped with the most effective and up-to-date technology available. In order to obtain such high-quality care, chances are you’re going to have to make the drive into the city. But if your health issues concern the realm of ophthalmology— virtually any issue related to the eye— you don’t have very far to travel. Sanjay Kamat, D.O., is located right in your backyard. Dr. Kamat is the owner of Bucks Eye Specialists in Yardley, where he has been treating disorders and diseases of the eye since inheriting the well-established practice from his childhood ophthalmologist in 2009. In the course of his career, he has treated just about every condition imaginable: cataracts, glaucoma and macular degeneration; dry eye; ptosis (drooping of the upper eyelid, which can compromise vision); blepharitis (chronic inflammation of the eyelids); and diabetic retinopathy (damage to retinal blood vessels caused by diabetes). In other words, “If it relates to the eye, I’ve seen it and treated it,” he says. One of the most common areas of treatment includes surgery to correct refractive error, which includes myopia (nearsightedness), hyperopia (farsightedness), astigmatism and presbyopia (the aging eye’s inability to see things up close). In his practice, the refractive surgery treatment options include highly accurate lasers such as PRK, LASIK, LASEK and epi-LASIK, among others. For PRK and LASIK, which are used for “typical” vision correction, Dr. Kamat uses four basic parameters—the patient’s age, refractive error, corneal thickness/topography and pupil size—to determine the best treatment option. In addition, Dr. Kamat has witnessed a significant increase in what he calls “combined procedures”—removing cataracts but also treating a patient’s glaucoma in one trip to the OR, for example, or removing cataracts and then adding implantable contact lenses. Another area of expertise for Dr. Kamat and his team: dry eye. It’s a significant problem, he says, with research suggesting the condition affects as many as 40 million people in the United States; based on what he’s seen, however, he believes the actual number is far higher. Patients with dry eye present with a wide array of symptoms— tearing, eye fatigue or the feeling that something is in the eye, for example—and can be caused by a lack of tear production or a lack of tear quality, among other issues. Although dry eye is common among postmenopausal women, the condition affects both genders, including younger people. The condition can be frustrating for multiple reasons, and it may hinder some patients from improving their vision. For example, dry eye may prevent people from wearing contact lenses, because the eye cannot tolerate contacts; likewise, the condition may prohibit patients from becoming candidates for refractive corneal surgery. Approximately six years ago, Bucks Eye Specialists was the first practice in the tristate area to treat dry eye with Intense Pulsed Light (IPL), a technology that emits brief, powerful bursts of light at specific wavelengths. Originally used in dermatology, IPL has become widely adopted in eye-care practices throughout the world. Dr. Kamat also offers Lipiflow, which is a “sister therapy” of IPL that essentially massages the eyelids. In addition, Dr. Kamat’s practice has become certified to perform clinical testing for dry eye. That means Bucks Eye Specialists can perform a comprehensive analysis of patients’ tears using two different methods: one to measure the salt content of the tear film; and another to determine the presence of any ocular inflammation. The results of these analyses will help the practice determine the best course of treatment, which might include artificial tear supplementation, omega-3 supplements or prescription eye drops, as well as IPL and/or Lipiflow. Lastly, the practice offers a complimentary service known as Meibomian gland testing. Using this service, a specialized camera takes a photograph of the inside of the eyelids to illustrate the anatomy of the Meibomian glands, which produce meibum, an oily substance that helps to lubricate the eye. Dr. Kamat says a condition known as Meibomian gland dysfunction, or MGD, is now being implicated in more than 80 percent of patients who suffer from dry eye. Dr. Kamat, who grew up in Bucks County, has been treating an increasing number of patients at his Yardley office every year since 2009. Also, as of last year, he opened a second office in Mount Laurel, N.J., under Briggs Eye Specialists. 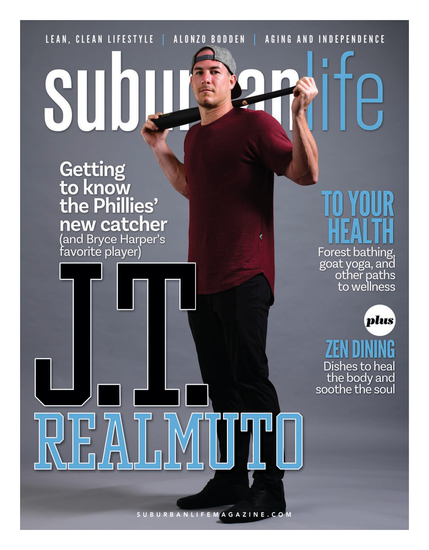 “It’s an extension of our practice here in Yardley,” he says. He forecasts continued growth in the months and years ahead. In Yardley, for example, he expects to soon add a corneal specialist to join him and fellow practitioner Dana Cianni, O.D. 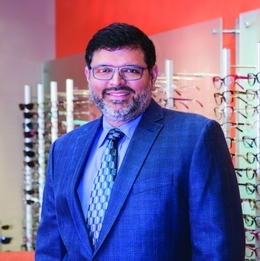 On both sides of the Delaware River, Dr. Kamat has earned a reputation for being not only one of the region’s foremost eye-care professionals but also a devoted supporter of the community. In September, Bucks Eye Specialists was a corporate sponsor of Yardley Harvest Day for the fifth year in a row. Patients aren’t the only ones who know a good thing when they see it. Dr. Kamat was recently invited to join the medical advisory board of Wills Eye Surgery Center in Warminster.